This is a list of 10 checklist items to complete before sending your first email. This procedure ensures that, from a subscriber's perspective, the email is coming from the sender with no mention of Listrak. More importantly, branding settings improve deliverability by distinguishing your email campaigns from other email senders, so your good reputation is not negatively affected by other companies. Read Ensure Branding is Complete to follow the simple steps required to completed your branding and authentication. There are three elements that are absolutely mandatory for your email send: a browser link, an unsubscribe link, and a physical mailing address. Browser Link: The browser link appears at the top of the message and directs subscribers that cannot view HTML to a web-hosted version of the message. Navigate from the home menu to Manage.Go to List.Then List Settings.Scroll to the message composition section.Select Yes for the setting Automatically insert the browser link at the top of the message? Unsubscribe Link: The unsubscribe link appears at the bottom of the message and allows contacts to opt-out of your list. It's important to allow them to easily do so because it is much worse for deliverability if those contacts mark you as SPAM. 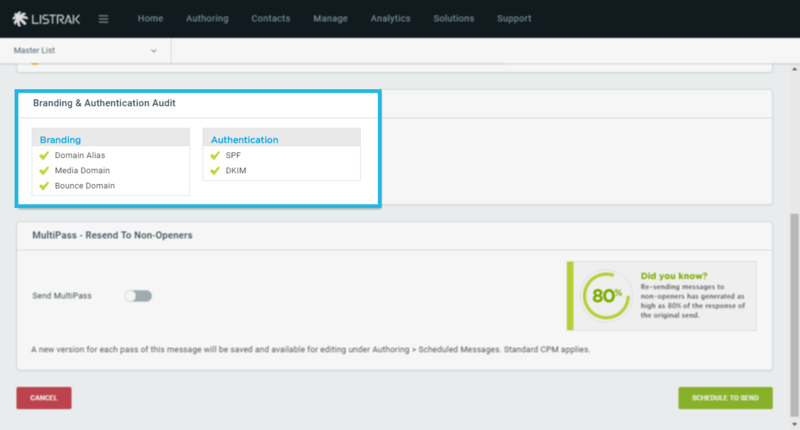 Navigate from the home menu to Manage.Go to List.Then List Settings.Scroll to the message composition section.Select Yes for the setting Automatically insert the list removal link at the bottom of the message? Physical Address: Always include a physical mailing address. This is one component of the CAN-SPAM laws. Read more in CAN-SPAM Act. 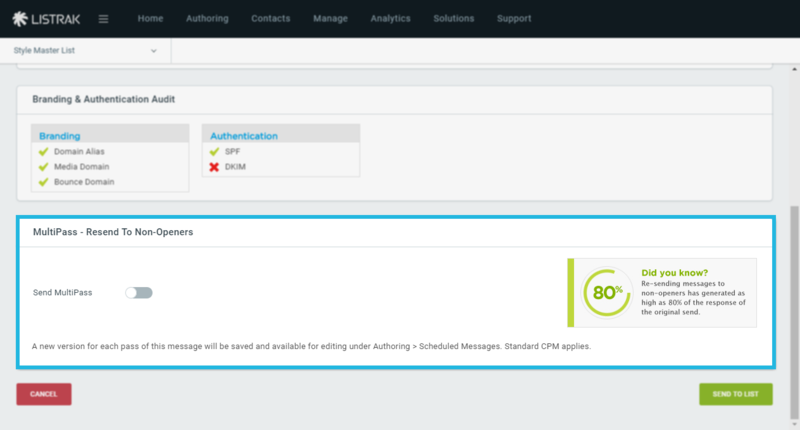 Once Google Analytics tracking is enabled, you’ll be able to include campaign and content values on the authoring page when creating messages. 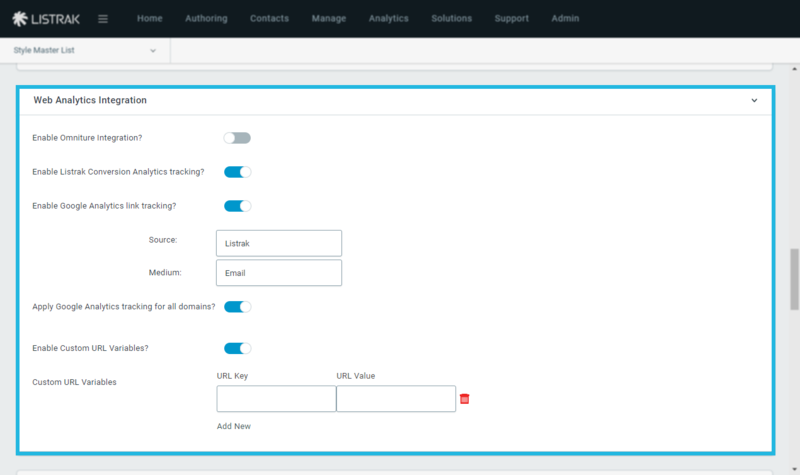 Scroll down to web analytics integration. You should always assign a campaign to each of your messages. The campaign name is used to organize various emails within Listrak. 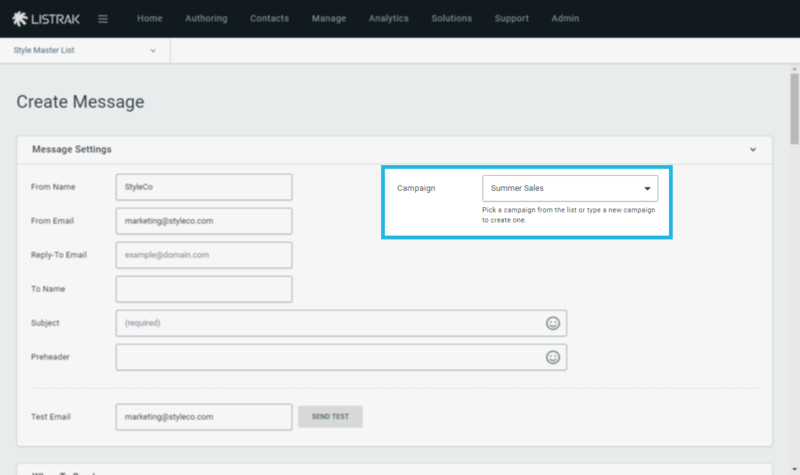 For example, if all messages sent in July are added to the July 2016 campaign, you’ll be able to view that campaign as a subtotal in analytics. Under message settings, enter a Campaign name. 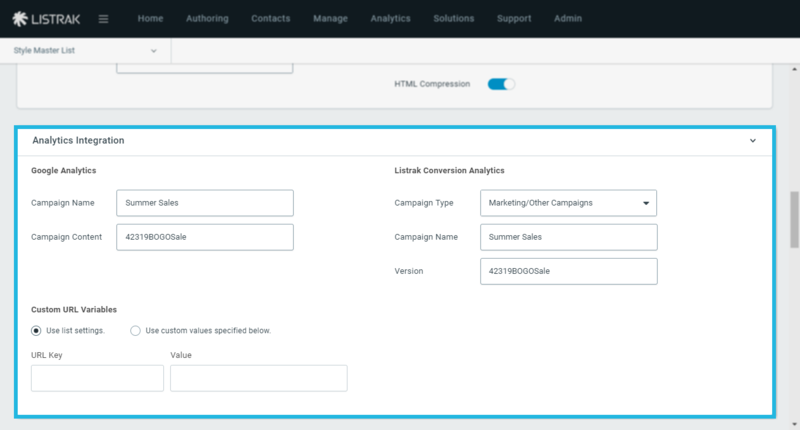 Another area of the authoring page that includes campaign is third-party web analytics integration (Google Analytics) and Listrak conversion analytics integration. When Google Analytics is enabled, Listrak automatically codes each link so that Google Analytics will track it. The medium is email and the source is Listrak, but you can enter the campaign name and content field. Best practice is to use a naming convention that includes the date of deployment and does not include spaces. In the example below, the campaign name includes the date as well as the Listrak campaign name, and the content field is the campaign type. Ideally, Google Analytics and Listrak Conversion campaigns should match. Many email marketers include a line of text above the body of the message. Depending on the domain, this preheader will appear in the inbox with the subject line. If you choose to include a preheader, ensure that the text supports the subject line and content of the message. Below is a Gmail example from LOFT. Now, here is how the message appears in the inbox. Notice that the preheader appears in the subject line. 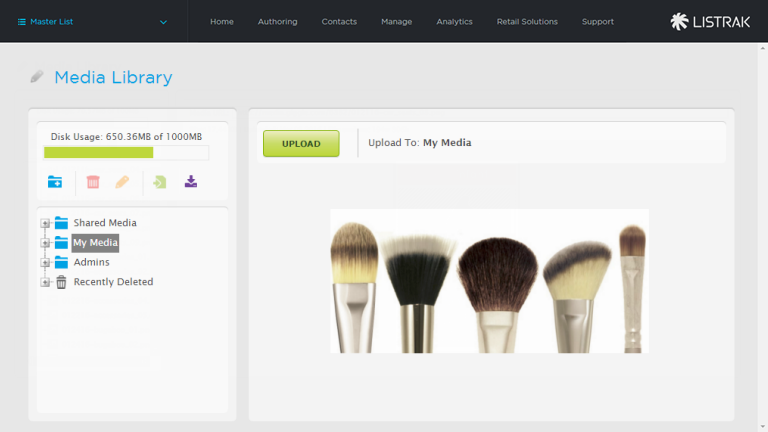 Listrak offers a media library to upload and store images to be used in your messages. This feature can be accessed via Authoring > Content & Media > Media Library or from the WYSIWYG toolbar. Once images are loaded, they will appear within the folder structure. Remember, if you move, rename, or delete an image, the link will break and it will not appear in the email – even if that email was already deployed. Double check to ensure that image names have not been changed and that no links are broken. We'll send a test message in step Number 10, providing you with the opportunity to verify that your images are rendering properly. TIP: All image links are based on the image name. So if you notice that you have the incorrect image in your email, you can simply upload a new version using the same name. The new image will appear in your email and you won't have to change the link. You should always define a target and enter a title tag when using hyperlinks. When the target is set to New Window, the hyperlink will open in a new browser window. The included title tag is used in Google Analytics and Listrak link tracking. Also, remember to hyperlink the main logo in your message to your website. The MultiPass feature allows you to deploy messages to only those who received the first message but didn't open it. The second pass can be the same email content as the original, just with an updated subject line. It's very important that you discuss this option with your account manager and together make an informed decision, as it can potentially negatively affect deliverability during the "warming up" phase as a new client. To view your send confirmation, click Schedule to Send or Send to List. 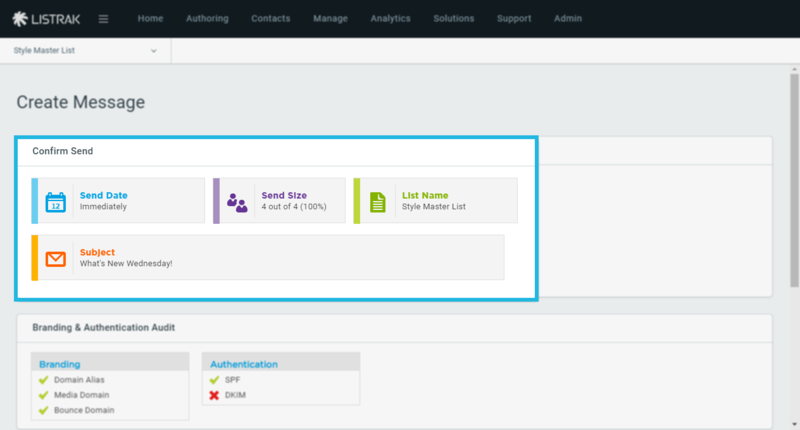 Send Test: You can find the Send Test button at the top and bottom of the authoring page. It defaults to the email address of the person logged into Listrak. You can change the address, but only one address at a time may be entered. Send Review: The Send Review button is located in the bottom left-hand corner of the authoring page. To define the review group, go to Manage > Lists > List Settings. Scroll down to List Review Group and enter the email addresses of people who should proof the message. 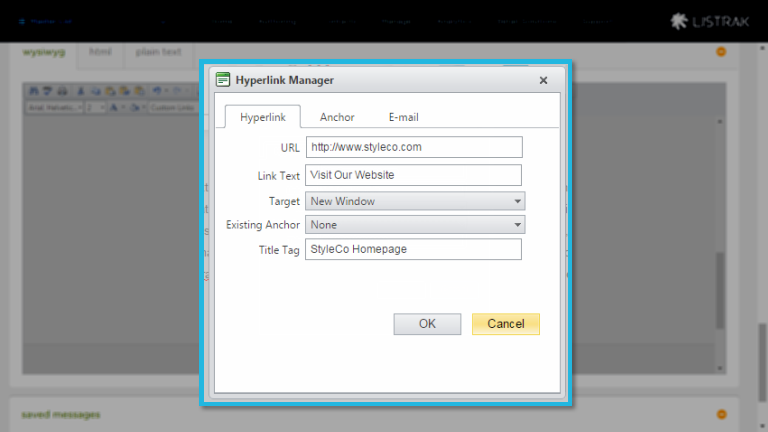 Click on every link to make sure the hyperlinks work and are directed to the correct target. Open and click the message in multiple domains such as Gmail, Yahoo, Hotmail, etc. Open and click the message in multiple email clients such as desktop, mobile phone, tablet. Ensure that the images in the message render clearly.